The surname Carillo, of Argao, Cebu, is derived from the family name Carrillo, which is Spanish in origin. 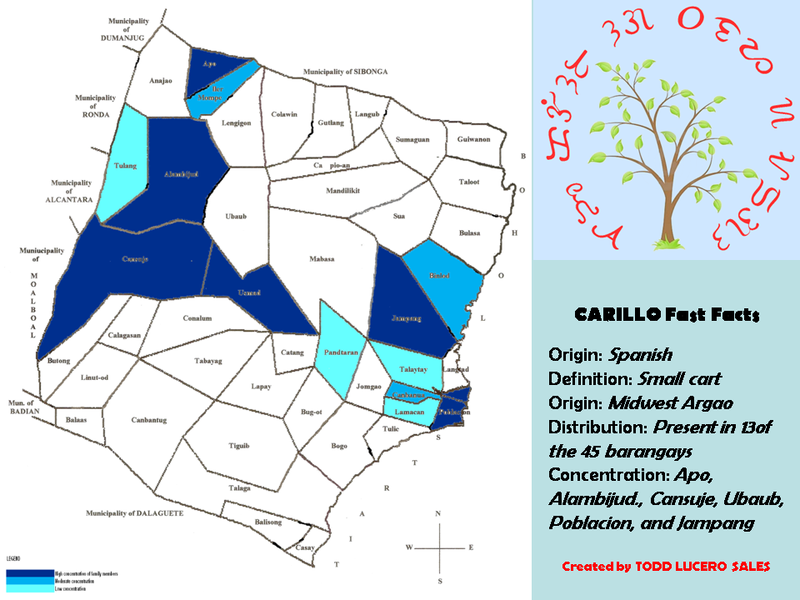 Indeed, there seems to be an interchange of the surnames Carillo and Carrillo; this does not matter though for it has been proven that both are one and the same, and differ only in spelling due largely to the hasty registration of family names in the past. Although it is an obvious Spanish surname that was included in the Catalogo Alfabetico de Apellidos in 1849 the surname has appeared in one record in 1848, which indicates that this has been carried by the family for some time even before the surname decree. The word “carillo” or “carrillo” is used to refer to any “small cart”. Indeed, the word seems to have been derived from the Spanish word carril, a masculine noun that means “cart”, “cartway”, “a narrow road”, “a lane”, or “rail”. Carril, being a cart, when added with the suffix lo, thus connotes something smaller, in this case a “smaller cart”. Thus, the surname then refers to anything that is related to a cart or road. Oral history passed on in the Carillo family maintains that they are descended from one of the crew members of Ferdinand Magellan. This, of course, is not possible to verify. What is likely is that the family has a Spaniard somewhere in the family tree and this story has been passed down from generation to generation. The Carillo family further believes that the first Carillo to arrive in the vicinity of Argao came from Zamboanga (again, there is no record to show this). This Carillo supposedly came to Argao to trade fish and the native delicacy ginamos. He decided to settle in Argao, and thus, the family became rooted in the town. Based on the records of the church of Saint Michael the Archangel of Argao, the farthest traceable Carillo is known by the name of JUAN NEPOMUCENO (also known as IGNACIO NEPOMUCENO). He married Maria Damiana (also known as Damiana Domitilia) and their son, IGNACIO FRANCISCO (CARILLO), married Catalina Juana Fortuna, daughter of Ignacio Pilias and Maria Birongula. It can be approximated that the farthest traceable Carillo in Argao was born sometime in the early 1700’s. The Carillo family has produced three cabezas de barangay during the Spanish period and three councilors before World War II. │┐│┐Wife: Valentina Mamen d. January 1873. │┐│┐│┐Husband: Miguel Davide b. about 1820; d. 1874. │┐│┐│┐Husband: Guillermo Oyangoren b. 1825; d. 1874. │┐│┐│┐Husband: Pablo Francisco Espina b. 10 January 1818; d. 1884. │┐│┐┐┐Husband: Gregorio Birondo b. 1829; d. 25 July 1880. │┐┐┐Husband: Nasario Bajenting d. 1869. For a pictorial family tree, click here.